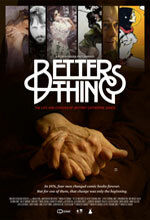 BETTER THINGS is a film about the artist Jeffrey Catherine Jones, a transgender painter and illustrator. Narrated and told through the experiences and perceptions of Jeffrey, it is guided and shaped by a group of creators who were influenced by and worked with Jeffrey at various stages of her life. At the beginning of the film, a question is posed: "Who is Jeffrey Jones?" Jeffrey did not have an answer. The film informs the viewer about Jeffrey's life at a level never provided to the public before, but does not claim to have answered the question. It is left to the observer to decide.